You asked for it and we offer it to you, it’s that simple! How do I get such a deal you may ask? Simple – or Simple Start! When you select iBusinessLogic.com, your local Tampa Bay Based WordPress and Joomla CMS specialist to build your website, you can take advantage of our free hosting offer below. The terms are simple, the limits are understandable and the deal is just one more way that we like to thank our customers for being the great people that they are! 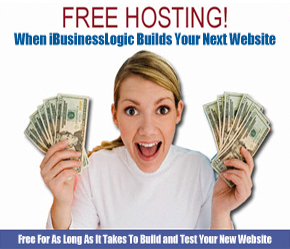 iBusinessLogic does not offer free hosting on through the links above, these are just provided for comparison reasons. Our clients free hosting plans are offered for as long as it takes to complete the development and testing of any website we develop. We determine when this period ends with the client but if there is a lag in essential information needed to complete any project from the client, we reserve the right to revoke this offer at any time. At the end of the development period, iBusinessLogic will offer to continue to host the website at our normal hosting rates, or to provide a full Cpanel backup for use to transfer the site to one of the web hosting sites listed above after the client has secured a hosting account with the long term host. We do this to save our client money and to make the initial process of getting started with a new website a breeze! Call of Contact iBusinessLogic for more details! Print Products - Business Cards - Brochures Etc.